Shown above is an image of an ice builder being loaded onto a lorry for export to the continent. 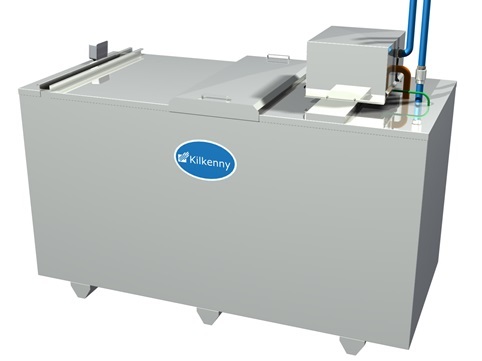 The Kilkenny IB-05-1250 ice water industrial process chiller has an ice reserve of 2,400kg (over 200kWh) making it a popular choice for medium and large dairy farmers and food production facilities. The Kilkenny ice builder sizes available range from 640 kg ice to over 4000 kg. Ice water systems, in contrast to glycol cooling systems, operate on the principle of stored energy, meaning they are suitable for applications where there is not enough available electrical power to deliver the required refrigeration duty on demand, or in applications where a huge quantity of cooling is required in a short space of time. The ice is built at off peak hours and used on demand. While the basic premise of operation of each machine is the same, each individual ice builder or glycol chiller is configured to the customers’ exact requirements – be it for dairy, food production, baking, industrial process chilling, brewing or draught beer dispense. Our team will design the manifold / distribution system and the controls to meet any specifications. Kilkenny Cooling Systems has been manufacturing glycol and ice water process chillers since the 1970’s and the company has exported to UK, France, Sweden, Poland, Russia, The Netherlands, Ukraine and North Africa.